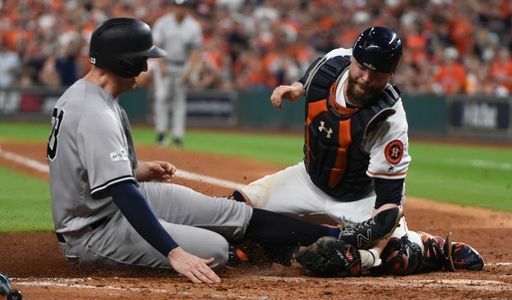 In a series that has featured mostly nail biting, closely contested games, the Yankees took the field at Minute Maid Park for Game 7 of the ALCS facing a tall task. Coming off a tough defeat in Game 6 that saw the Astros offense wake up, it was clear Minute Maid would provide a hostile environment from the first pitch on. The home team had won every game in this series up to this point and the Yankees would have to break the trend if they were going to advance to their first World Series since 2009. The matchup saw Astros right hander Charlie Morton facing off against veteran lefty CC Sabathia. While CC has been the Yankees stopper all season, it would come down to whether the Yankees offense would finally be able to break through on the road. Although this Yankee team has risen to the occasion many times this season, they would come up short this time and falter just a game shy of the World Series. In a rematch of Game 3 that saw CC get the better of Morton, Morton would have the benefit of pitching in front of his home crowd this time around. Morton came out and set the tone early, striking out two in the top of the first on his way to five scoreless innings of two hit ball. For the first three innings CC matched Morton despite clearly not having his best stuff. CC would battle like the warrior he is, holding the Astros off the board until the top of the fourth inning. Astros DH Evan Gattis would lead off the inning and battle Sabathia for eight pitches before hitting a solo home run deep to left center field. Three batters and two baserunners later, CC was out of the game and gave way to Tommy Kahnle. Kahnle would quickly get George Springer to ground into a double play to end the threat. Altogether CC gave the Yankees 3.1 IP while allowing one run and walking three. With Morton continuing to hold the Yankees offense down, the game would begin to slip away in the bottom of the fifth. With one out in the inning, Jose Altuve powered a home run over the right field wall for a solo shot. Two singles and a strikeout later, Brian McCann delivered a two out, two run double to stretch the Astros lead to 4-0. 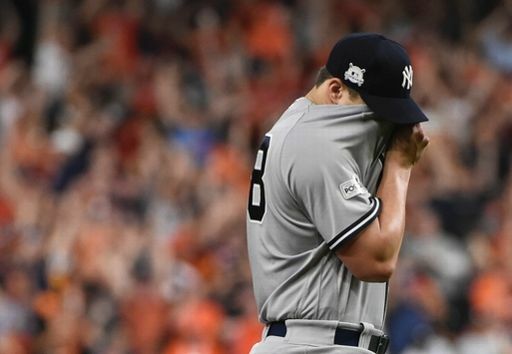 Kahnle would depart the game and on came Adam Warren to end the inning without further damage. 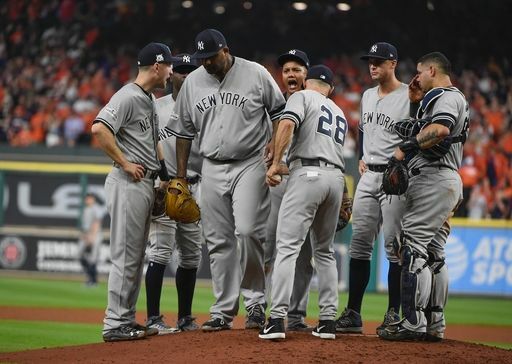 While the Astros pitching was very good throughout the game, The Yankees had a few chances to get back in the game that they failed to take advantage of. Greg Bird led off the fifth inning with a double and made it to third with one out following a wild pitch. After a walk to Aaron Hicks, Todd Frazier hit a chopper to third base. Bird was going on contact and thanks to a great play on both ends by Alex Bregman and Brian McCann, Bird was cut down at the plate and the Yankees were held off the board. In the top of the sixth Brett Gardner led off with single but the next three batters went down in order and another chance was wasted. Lance McCullers would emerge from the Astros bullpen and complete the final four innings to end the Yankees season and capture the American League Pennant for the Astros. This Yankees' season has been a heck of a lot of fun for us all here at the BBB and while the Yankees are finished, there is still baseball to be played. Game 1 of the 2017 World Series will be Tuesday night in Los Angeles between the Dodgers and the Astros with first pitched scheduled for 8:09 PM. Thank you to everyone who stuck with us throughout this season, we hope you come back for more next year!